PSA has bought the Ambassador brand. Its cars are used as taxis in India. PARIS -- India remains a tantalizing prize for foreign automakers, who see an upwardly mobile, rapidly urbanizing and technologically savvy country that could potentially pass Germany this year as the world's fourth-largest auto market. But success has not come so easily for hopefuls that have recently included Volkswagen, General Motors and Honda. PSA Group believes it has a key to unlock that market after earlier forays failed through new joint ventures with CK Birla Group, a conglomerate based in New Delhi, to produce powertrains and assemble vehicles. In a smaller -- but no less visible -- move, PSA also has bought the rights to the iconic Ambassador nameplate from CK Birla. "This is a high-growth potential market, even though it is one of the most challenging markets in the world." CEO Carlos Tavares told investors and analysts at PSA's 2016 results conference earlier this month. European automakers such as PSA are used to competing fiercely for every fraction of a percentage point in their home region so India's challenging market is not so daunting. Light-vehicle sales in India (including commercial vehicles under 6 tons) are projected to grow to 6.1 million units in 2022 from 3.4 million units in 2016, according to IHS Markit. Anil Sharma, a principal analyst with IHS in New Delhi, said he expected 8 percent to 9 percent growth in the light-vehicle market this year, at a time when auto sales in Europe are projected to be largely flat, and perhaps 12 percent growth in 2018. Moreover, the car penetration rate is just 22 per 1,000 inhabitants, IHS noted in an analysis. "The market has ample headroom over the next decade," Sharma said. PSA has not outlined a specific model strategy for India, other than to say that it plans to start by producing 10,000 to 15,000 vehicles annually at a Hindustan Motors plant in Chennai where automakers such as Renault-Nissan, Ford Motor and Hyundai-Kia have plants. Production could rise to 100,000 vehicles a year. French analysts firm Inovev said the CK Birla tie-up and Ambassador buy are an important step for PSA's expansion in emerging markets because the Ambassador brand is still very well known in India. 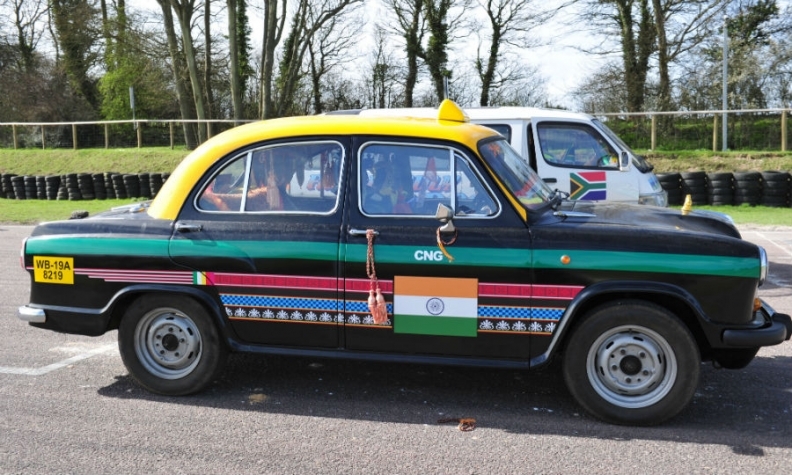 Based on the UK-built Morris Oxford, the car was an upscale choice for senior officials and members of the Indian government before it became a favorite for taxi drivers. There are 600,000 Ambassadors in circulation in India today, Inovev said. Sharma said PSA had two paths to profitability and growth in India -- either through economies of scale or a plan that revolves around products carefully tailored to the market. "A lot of companies dreamed they could sell their 'global' vehicles in India, and consumers would lap them up," he said. "It never happened that way. Some of those companies struggled to come to terms with the fact that India is a unique market and needs unique products." "What sells in India are hatchbacks, and increasingly compact SUVs, B sector crossovers," he said. "They are a relatively new addition to the market, but they have picked up really well." Sharma cited Renault's best-selling Kwid as an example of a vehicle that hit the sweet spot between value and practicality. "Before Kwid, we didn't have SUV- or crossover-shaped hatchbacks with raised ground clearance," he said. "You can take it rural areas and be reasonably sure the underbody won't be scraped by potholed roads." Already, new competitors are entering that market. At the Geneva auto show, Tata Motors -- whose Nano was billed as the least-expensive new car in the world when it was introduced in 2009 -- showed a production version of the Nexon compact SUV. Tata and Volkswagen have formed an alliance that could create a shared car-manufacturing platform and give VW a better Indian foothold through its Skoda budget brand. PSA's earlier efforts to make headway in India included a joint venture in the late 1990s with a local partner, Premier Automobiles, that ended after several years and an abortive decision in 2012, at a time when the group was in financial difficulties, to invest 650 million euros in a plant in the state of Gujarat. "PSA have a lot going for it in this agreement" with CK Birla, Sharma said. "They don't have to put down a lot of money for machinery and land. All of this adds up -- not just in terms of assembly operations, but also in sales and distribution." This time, Tavares told analysts, PSA has done its "homework" on the Indian market, working with local partners to avoid foreign exchange volatility and customs duties. "If we do this properly, I think we have found a very investment-efficient, a very frugal approach to this comeback to the Indian market," Tavares told investors. "But I just want to tell you that this will be a long-term story."